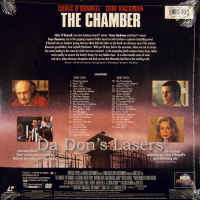 The Chamber 1996 - 113 min. - Color Genre: Thriller Rated R Country: USA LaserDisc Movie Storyline: Angry Klansman Sam Cayhall is on death row for the 1967 murder of two Jewish boys, and is a month away from execution. But Cayhall's grandson, young, idealistic lawyer Adam Hall, boldly decides to represent him, and if possible, prevent the punishment from coming to pass. The pair's prickly meetings force both men to confront their family's very dark secrets. Meanwhile, Adam keeps running into brick walls as he tries to gain clemency for his familial client. That is, until new evidence appears suggesting that Sam is not the killer. But with the clock ticking, will Adam have enough time to save his grandfather? 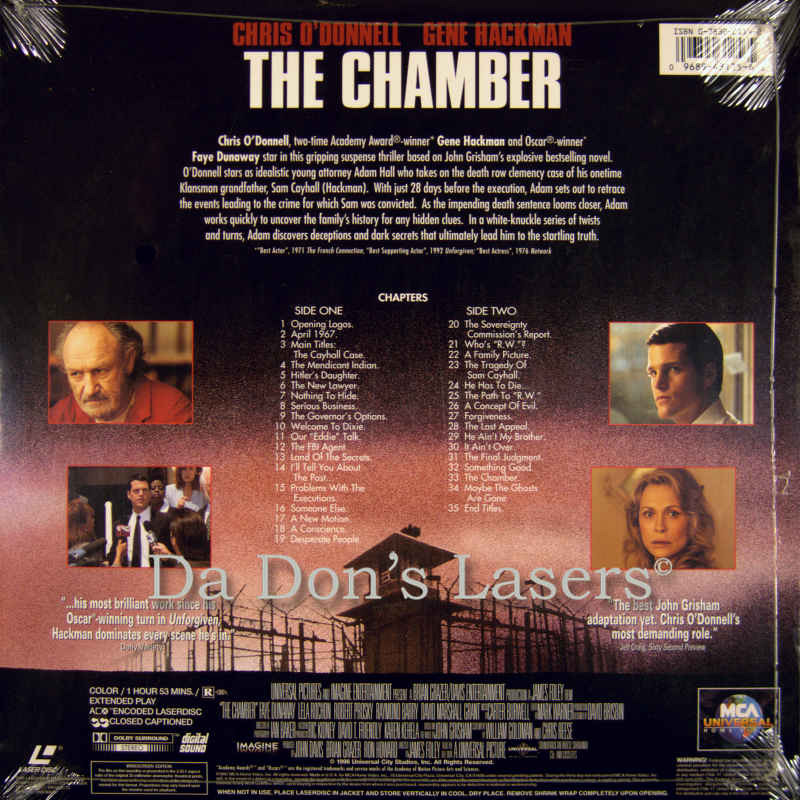 LaserDisc Movie Review: Based on a novel by John Grisham, this drama deals with a man trying to come to terms with his family and their ugly secrets. Adam Hall (Chris O'Donnell) is a successful attorney based in Chicago who travels to Mississippi to look into the case of Sam Cayhall (Gene Hackman). An outspoken racist and member of the Ku Klux Klan, Cayhall was convicted in the early '60s of the murder of a Jewish civil rights lawyer and his children. Pending a last-minute appeal, it looks as if Cayhall will finally go to the electric chair, and Adam has arrived to see what he can do. It hardly seems like the sort of case Adam would normally be involved with, until we discover Adam's secret: he is actually Cayhall's grandson, and despite his misgivings about the man's racist views, he wants to see if he can spare his life. Cayhall, however, has little use for Adam and even less regard for his legal skills. As Adam spends time with his Aunt Lee (Faye Dunaway), who witnessed Cayhall's execution of a black man years ago, he gets a more complete and disturbing picture of Cayhall's race hatred and the terrible toll it has taken on his family and the community. The Chamber marked the acting debut of former baseball and football star Bo Jackson. 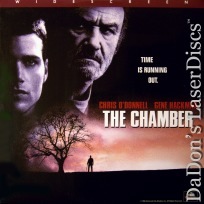 --- Mark Deming Like many screen adaptations of John Grisham novels, The Chamber is a competent but unremarkable piece of pop legal entertainment. Unlike most Grisham flicks, the outcome is genuinely unpredictable --- which makes the film's inability to generate suspense all the more criminal. Chris O'Donnell is the idealistic white bread lawyer du jour, but he's even more of an interchangeable part from Grisham's oeuvre than most. Gene Hackman is flashier as the irascible bigot on death row, but he lacks the seething intensity that made James Woods' similar character so memorable in Ghosts of Mississippi. Both roles would work better if The Chamber established a smooth narrative, a usual strength of Grisham's tight storytelling. But the story has no arc beyond the ominous countdown to execution day, such that unspecific briefs are filed and pleas made without any sense of mounting importance. This gets at an overall lack of purpose in the script, which can't make a strong case for Cayhall's life beyond the standard arguments against the death penalty as an institution. The Chamber hits on some interesting issues when pondering Cayhall's fierce code of silence, or the way his notoriety affects his unwitting offspring. But it gets bogged down in the repetitive tete-a-tete between attorney and client, grandson and grandfather, which serves more as a platform for the actors than a conveyer of thematic insight. --- Derek Armstrong Thanks for Visiting DaDon's Rare LaserDiscs ! Reviews, Articles, Newsletter and Information for Movies on LaserDisc LD Laser Disc, LazerDisc.